Until 2017, Russian social network Vkontakte (VK) was one of the most popular web-resources in Ukraine. For Ukrainians, it was a source of accessible (and often pirated) content - videos, music, and entertainment. It was also a tool of Russian soft power, luring Ukrainians into an information sphere dominated by Russian narratives. Vkontakte has become an even more dangerous Russian information weapon since 2014, when Kremlin-adjacent officials and oligarchs gained control over the company. This turned the network into a Kremlin-controlled tool to spy on VK users, including Ukrainians. Who is still using the network in Ukraine? Did the Ukrainian sanctions work? 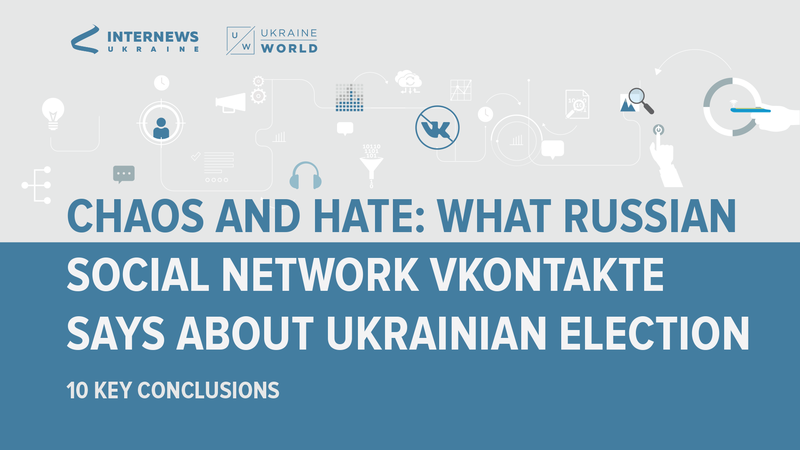 What are Ukrainian VKontakte users writing about? Whom do they love? Whom do they hate? What are they saying about the Ukrainian election? *Internews Ukraine and its data research partners studied 1,000,000 profiles of the Ukrainian segment of VK and almost 10,000,000 posts (between November 1st, 2018 and February 14, 2019) to understand: what is going on here ahead of the Ukrainian elections? Clustering of text using NLTK, Scikit-learn libraries etc. The Ukrainian segment of Vkontakte (VK) has been dwindling since 2017. Today, significantly fewer Ukrainian users share or follow posts on this network. Even the most popular posts about the Ukrainian elections rarely reach 100 "likes" at the most, and often do not surpass 1000 views. Many pro-Russian websites, projects, bloggers turned their primary activity from VKontakte to other networks such as Facebook. This can be seen as a direct consequence of the Ukrainian sanctions enacted on certain Russian internet products, including VKontakte, in 2017. However, pro-Russian rhetoricis now much more widely represented in VK posts than in 2017. Today, Vkontakte is a breeding ground for the "Russian world" messages and narratives to a greater extent than a few years ago. The greatest total number of active users in the Ukrainian segment of Vkontakte are located in the Donetsk oblast, followed by Dnipropetrovsk oblast. Kyiv city comes third. Luhansk oblast is fourth, followed by Kharkiv oblast and Odesa oblast. The greatest number of active VK users who wrote about the election are located in Donetsk oblast (29.7%), followed by Dnipropetrovsk oblast (10.7%), Luhansk oblast (9.9%) and Kyiv city (7.9%). The top 10 most reposted web-sites in the Ukrainian segment of Vkontakte regarding the Ukrainian elections are primarily pro-Russian or anti-government (separatist) in nature, for example news-front.info, rusvesna.su, politdnr.ru, nahnews.org, ukraina.ru, and politnavigator.net. These are mostly websites promoting Russian narratives, usually while eschewing political correctness and using hate speech. There are different opinions about different candidates in the presidential elections expressed on VK's Ukrainian segment. But one trend remains consistent for everyone: negative messages about the candidates always outweigh the positive ones. Volodymyr Zelenskyi is the only Ukrainian candidate who is regarded somewhat positively by Vkontakte users. 26% of posts mentioning Zelensky are positive. But even in his case, negative messaging is prevalent: 32% of the posts about him have negative tonality. Zelenskyi's negative-to-positive ratio is better than those of the others, but he still gets quite a lot of insults and abuse. Ukraine's current President receives the biggest amount of hate speech in the Ukrainian segment of Vkontakte: 67.5% of posts about him have negative tonality. He gets a lot of pejorative names and insults: "Patient-2019", "Russia-phobe Poroshenko", "bloody Ukrainian confectioner", "bloody marionette", "the worst President", "potroshenko" (a play on words, presenting him as a maniac killer), "poproshenko" (a play on words, from Russian "poproshaika" -- "beggar"), "the chocolate Fuehrer", and many more. While VKontakte users are openly hostile to pro-Western and anti-Kremlin candidates, they do not have much attraction to candidates with relatively pro-Russian rhetoric either. For example, 40% of mentions of Yuriy Boyko have negative tonality; 35.5% mentions of Oleksandr Vilkul are negative too. Out of Eurosceptic candidates, only Yevgeniy Murayev has a lower percentage of negative messaging at 19.5%. The Ukrainian VK segment is a place where hate speech is flourishing. Here are a few examples about the candidates: Poroshenko is called a "chocolate Fuehrer" and a "bloody confectioner"; Tymoshenko, an "elderly grandmother" and "fake goddess of the poor"; Zelenskyi, a "Jewish comedian" and "jester"; Hrytsenko -- an "honest thief", etc. Ukraine and Ukrainians in general also get a lot of hate speech descriptions: they are "bourgeois scum", "stinking hypocritical animals", "khokhlo-f*ggots" (khokhol -- a Russian pejorative name for Ukrainian), "little juntas" and many, many more. The analysed VK posts are often openly anti-Semitic. For example, Zelenskyi is often called "khabatovets" and "khabadnyk" (in the conservative "Russian world" mythology, this is a designation for wealthy Hasidic Jews who want to dominate the world using the "Jewish information field" and "Jewish capital"); Poroshenko -- "Petya Waltzman"; Tymoshenko -- "Juda Volodymyrivna" etc. Antisemitism is also a part of the "Russian world" narrative of the conflict in Eastern Ukraine: the war on Donbass is often presented as a war of the pro-Russian "Slavs" against the pro-Western "judeo-masons". The main message of the Russian propaganda is that Ukraine is a "failed state" which will soon collapse, that it does not really exist, and that everything will shortly drown in chaos. This message is widespread on top Russian TV channels and websites, but it is also flourishing in the Ukrainian Vkontakte segment. Similarly widespread are other typical messages about "fascist Ukrainians", about the mortal danger of Euro-Atlantic integration, and about the need to re-integrate with Russia.